By Cameron Dixon et al. In recent years Australian wild catch prawn fisheries have had to compete with increasing volumes of cheaper, aquacultured imports. This has resulted in reductions in prawn prices and reduced profitability for prawn fisheries. Historically, the primary focus of management for these fisheries has been biological sustainability. Given their demonstrably sustainable management histories, there is now an urgent need to examine approaches for maximising profitability. South Australia has single species prawn fisheries in Spencer Gulf and Gulf of St Vincent that target the Western King Prawn. Both fisheries have management plans that include a detailed harvest strategy to guide fishing activities, and performance indicators for assessment of fishery performance. While there are performance indicators to assess overall economic performance, economic needs are not explicitly considered in the harvest strategy. This project provided the prawn industries with a new mechanism to determine fishing strategies that optimise the economic returns to the industry rather than the current focus on biological sustainability. Additionally, the model will enable economic examination of alternate management strategies, such as reduction in the size of the fleet, which may provide significant long-term benefits to the industry. 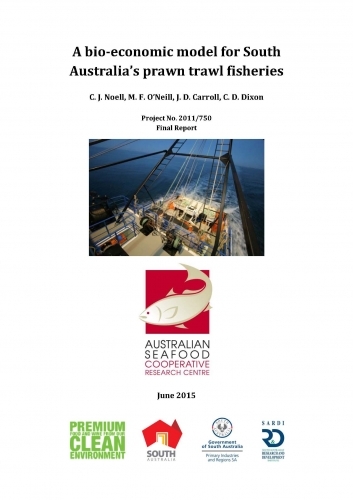 Provide extension of the developed model and its outputs to stakeholders of other Australian prawn trawl fisheries.